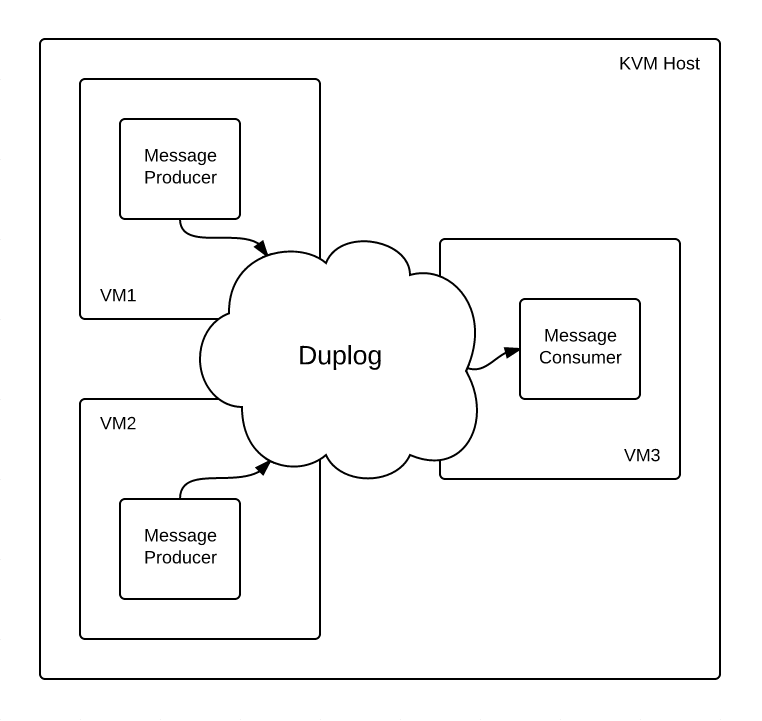 In my last post I introduced Duplog, a small tool that basically forms the glue between rsyslog, RabbitMQ, Redis, and Splunk to enable a highly available, redundant syslog service that deduplicates messages along the way. In order for Duplog to serve the needs of a production enterprise, it will need to perform well. I fully expect the deduplication process to take a toll, and in order to find out how much, I devised a simple benchmark. One one side, fake syslog generators pipe pairs of duplicate messages into the system as fast as they can. On the other, a process reads the messages out as fast as it can. Both sides report the rate of message ingestion and extraction. The initial results were a little underwhelming, pushing about 750 messages per second through the system. I originally expected that hashing would be the major bottleneck, or the communication with the Redis server, but each of those processes were sitting comfortably on the CPU at about 50% and 20% usage, respectively. 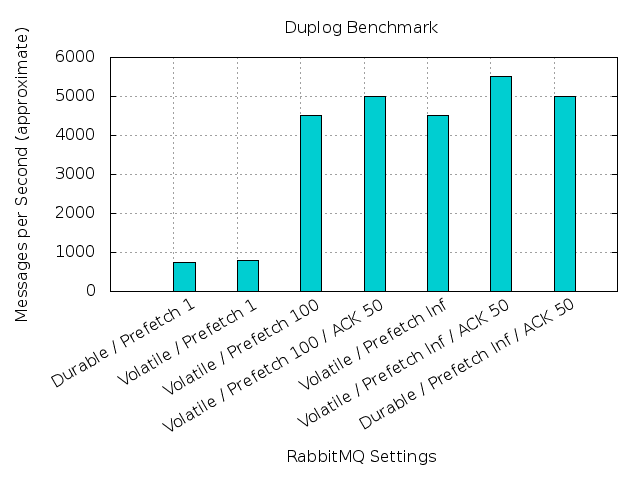 It turned out that the RabbitMQ message brokers were the source of the slow performance. So then I changed the prefetch setting. Rather than fetching and acknowledging one message at a time, going back and forth over the network each time, the message consumers can buffer a configurable number of messages at a time. It is possible to calculate the optimum prefetch count, but without detailed analytics handy, I just picked a prefetch size of 100. That setting made a huge difference, as you can see in the histogram. Without spending so much time talking to RabbitMQ, consumers were free to spend more time calculating hashes, and that left the RabbitMQ message brokers more free to consume messages from rsyslog. Another suggestion on the internet was to batch message acknowledgements. That added another modest gain in performance. Finally, I tried enabling an unlimited prefetch count size. It is clear that caching as many messages as possible does improve performance, but it comes at the cost of fairness and adaptability. Luckily, neither of those characteristics is important for this application, so I’ve left it that way, along with re-enabling queue durability, whose performance hit, I think, is a fair trade-off for message persistence. I also reconfigured acknowledgements to fire every second rather than every 50 messages. Not only does that guarantee that successfully processed messages will get acknowledged sooner or later, it spaces out ACKs even more under normal operation, which boosted the performance yet again to around 6,000 messages per second. So is 6,000 messages per second any good? Well, if you just throw a bunch of UDP datagrams at rsyslog (installed on the same servers as above), it turns out that it can take in about 25,000 messages per second without doing any processing. It is definitely reasonable to expect that the additional overhead of queueing and hashing in Duplog will have a significant impact. It is also important to note that these numbers are sustained while RabbitMQ is being written to and read from simultaneously. 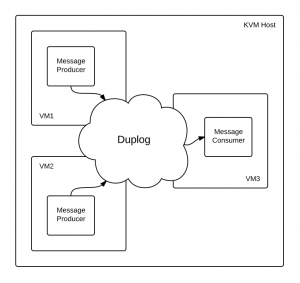 If you slow down or stop message production, Duplog is able to burst closer to 10,000 messages per second. The queueing component makes the whole system fairly tolerant of sudden spikes in logging. For another perspective, suppose each syslog message averages 128 bytes (a reasonable, if small, estimate), then 6,000 messages per second works out to 66 GB per day. For comparison, I’ve calculated that all of the enterprise Unix systems in my group at UMD produce only 3 GB per day. So as it stands now I think that Duplog performs well enough to work in many environments. I do expect to see better numbers on better hardware. I also think that there is plenty of optimization that can still be done. And in the worst case, I see no reason why this couldn’t be trivially scaled out: divide messages among multiple RabbitMQ queues to better take advantage of SMP. This testing definitely leaves me feeling optimistic. This entry was posted in Programming, System Administration and tagged deduplication, duplog, java, rabbitmq, redis, splunk, syslog by James Lee. Bookmark the permalink.